Spring is here, and that’s when we start thinking about projects to do around the house – both interior and exterior. One project that many of us don’t include on our list is gutter cleaning. Gutters sit at the eaves and capture rainwater coming from the roof. Throughout the seasons, gutters can slowly become clogged with leaves, blown debris, granules shedding off shingles, and more. If your gutters aren’t cleaned on a regular basis, they can become so full of debris that water no longer flows freely into the downspouts. This forces water to spill over the sides or contribute to ice dams. If you’ve seen any of these issues, then your gutters may be the problem. It’s time to inspect them and remove any twigs, leaves or other debris. Spring is the perfect time to clean your gutters. The weather is usually mild, and gutter cleaning helps to prepare your home to deal with any severe summer storms. While you can certainly clean gutters yourself, there are dangers in climbing up ladders and trying to remove gutter muck at high heights, especially on large homes. A professional can assist you with this and other gutter-related tasks. Advantage Seamless Gutters has the best local gutter installers around. You can count on us to provide you with the best customer service. 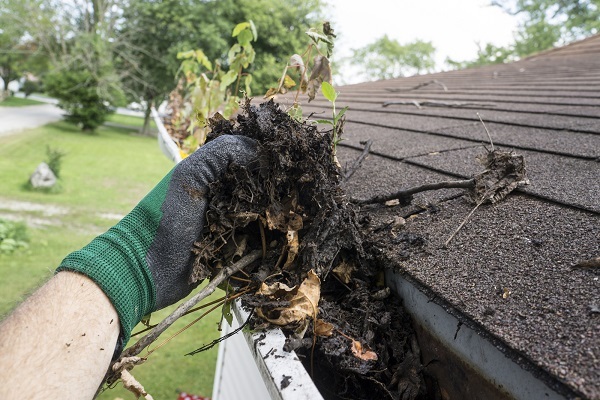 Don’t let clogged gutters cause damage to your home and landscaping. Contact us today at (218) 270-2663 to learn more about our services and schedule your next gutter inspection and cleaning. We provide services to homeowners throughout Baxter, Brainerd, MN and the surrounding areas.